Carnival Cruise Line has announced new details on the accommodations and entertainment that will be available aboard their upcoming ship, Mardi Gras. The vessel will include over 180 suites in 11 styles, including the new premium Carnival Excel suites with access to a resort-style, open-air enclave called Loft 19. The new Excel level will include 32 suites in four categories. The two Carnival Excel Presidential Suites will be the largest in the fleet and located on deck 17. Separate living, dining, and sleeping areas comprise the space, along with Carnival’s most expansive balconies featuring sunbeds, a hot tub, and outdoor shower. These staterooms also include access to the spa’s thermal suite and the Havana pool area. 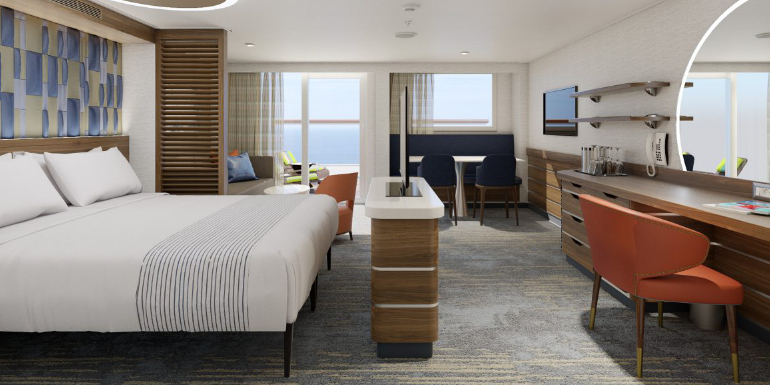 Twelve Carnival Excel Aft Suites will be found on Mardi Gras, which overlook the Summer Landing section of the ship and boast separate living rooms and bedrooms along with wraparound balconies and an outdoor hot tub. There will also be twelve Carnival Excel Corner Suites on the port and starboard sides of the ship, featuring separate sleeping and lounging areas, a wet bar, and wraparound balconies with an outdoor dining table and loungers. 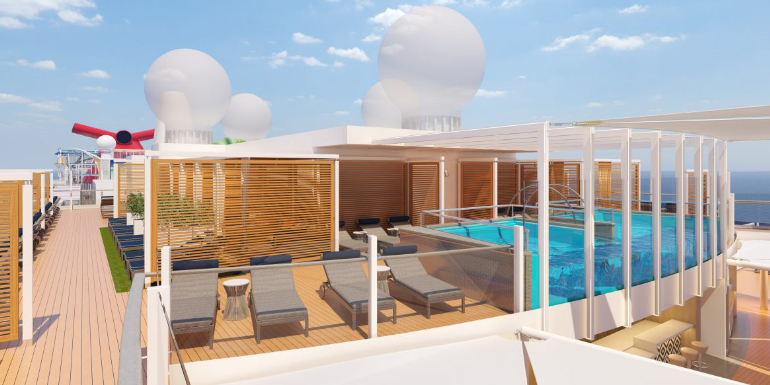 Lastly, the ship will include six Carnival Excel Suites on decks 10, 11, and 12 with sleeping, dining, and relaxing areas as well as balconies with dining tables and loungers as well. All suites on Mardi Gras will include an amenities package with priority boarding/debark, priority seating in the main dining room, plush bathrobes, and bottled water upon arrival. Those staying in the Excel suites will enjoy those amenities plus unlimited access to Loft 19, guaranteed specialty dining times, a complimentary soda package, free laundry, and more. This private space located on the ship’s highest deck is a brand new concept for Carnival. The secluded retreat has been modeled after the world’s best resorts with a private pool surrounded by loungers and full bar service. Cabanas are also available to rent, and come stocked with beverages, chilled towels, robes, fresh fruit, lunch delivery, and concierge service. 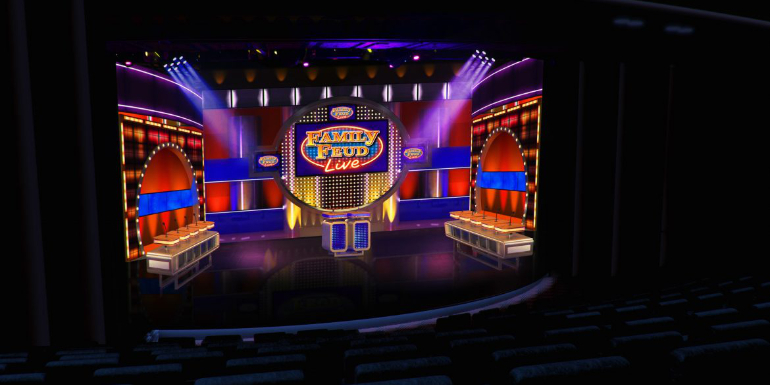 Carnival Cruise Line also revealed that they will be debuting an at-sea version of the popular show Family Feud aboard Mardi Gras, called Family Feud Live! Family Feud Live! Will follow the same format and feature the iconic set from the TV show. Two five-person teams will battle it out in rounds like Face Off and Fast Money by naming the most popular answers to survey questions for a chance to win a number of prizes. The live show will be hosted by the ship’s cruise director. Several variations will be played, with both family-friendly and adult-oriented shows. Read about Mardi Gras' dining, activities, and more here! Are you planning to sail on Mardi Gras?